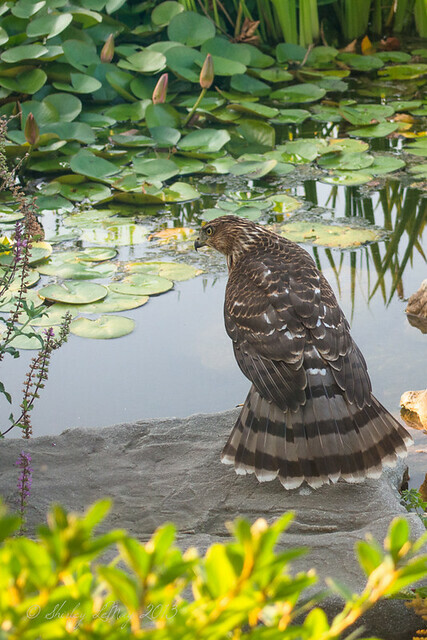 We had a surprise visitor to our backyard pond the other day - a young hawk! Scott noticed him (her?) perched on one of the stones, looking down at the water. He appeared to be watching the gold fish in the pond. Maybe hoping for an afternoon snack? 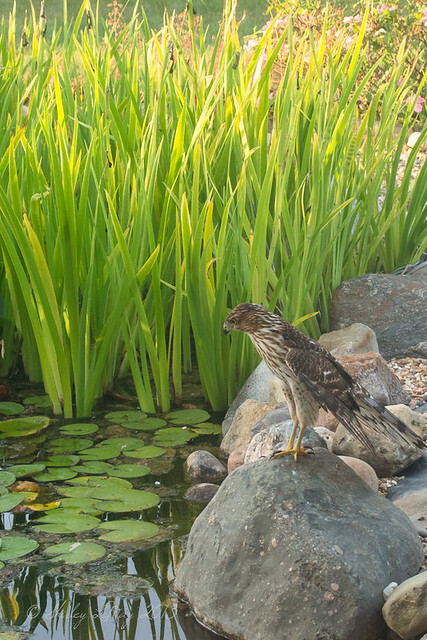 Then he moved closer to the house - on to the cover of the pond's recirculation pump, where he continued to look down at the water. He was less than 3 feet away from the house - certainly the closest I've been to a raptor in the wild. I didn't get a decent photo of him in flight, but it was cool to watch. He never did take anything from the pond, either. We only have little goldfish in the pond and since some of them swim very close to the surface, I thought he would grab one. I am not any sort of raptor expert, so if anyone out there knows what type of hawk this guy is, please let me know in the comments! Shared with Tuesday's Muse and Communal Global. Wow, beautiful bird, how nice that he was so close! Loving the tail feather fan he's presenting! Isn't that something! I would have guessed a Hoopers Hawk too. 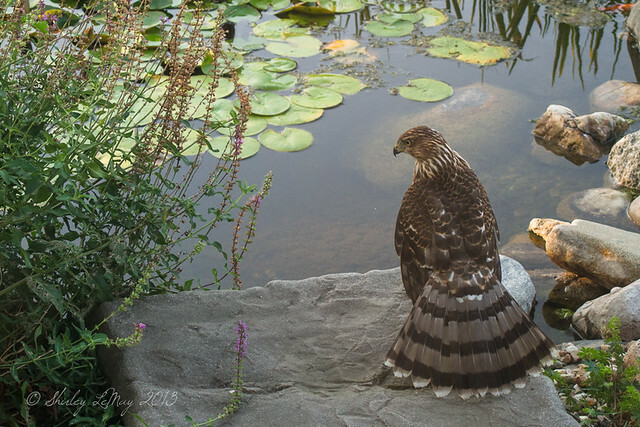 We had one fly into our patio window last year after landing near our pond. Maybe they like fish? Great pics! Awesome photos---how close could you get to the bird?? I have never seen one this close up.